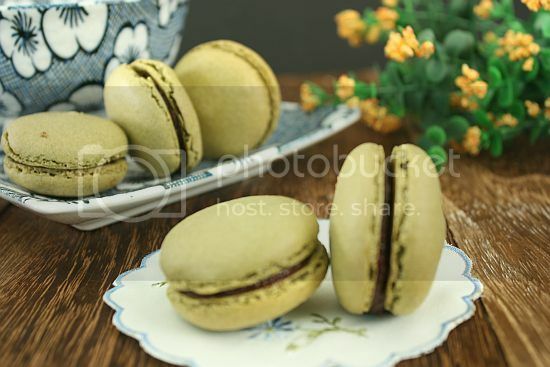 It has been ages since I have made any french macarons. Not because I have been lazy but the last few times (which was more than half a year ago) I had tried making some, they have all failed. I had cracked and shapeless macarons, and all without "feet". Not that they lacked in taste, they were simply ugly! So when my niece, Caitlin, from Melbourne came to visit me before Christmas, one of the things she wanted to learn to bake was french macarons. She is 11 years old and quite a little budding baker I must say. She recently baked a whole black forest cake including decorating it with icing for my brother's birthday last November. She even ventured into making her own fondant using a recipe I had posted in my blog and made little figurines out of them. So enthusiastic was she in this, that she sent me photos of them to comment. So how could I disappoint her by denying her wish. I did however warn her of my past failures and not to keep her hopes too high on seeing "feet" on these macarons. When I first tried my hand at french macarons, one of the "safe" recipes that I had used was from David Lebowitz's blog. So I decided to fall back on this recipe again and it worked like a charm. Caitlin helped me to pipe the chocolate macarons onto the baking trays and she was extremely excited when "feet" eventually appeared. 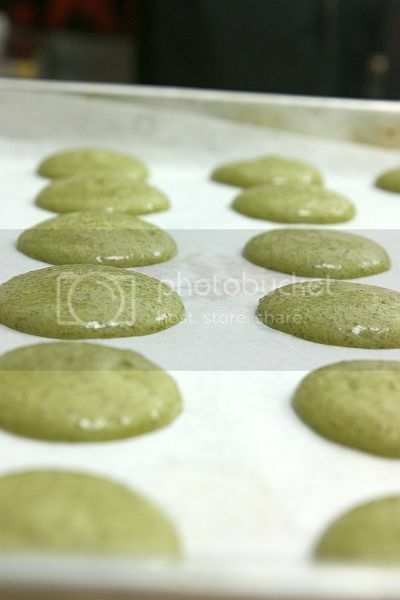 A couple of weeks later I decided to make another batch of macarons on my own and I adapted the same recipe for matcha flavour instead of chocolate. I think I am going to stick to this recipe in the future since it has worked twice for me in less than a month. 2) Line two baking sheets with parchment paper and have a pastry bag with a plain tip (about 1/2-inch, 2 cm) ready. 3) Grind together the icing sugar with the almond powder and matcha in a food processor for about 10 seconds. Remove and sieve through a fine siever and set aside. 4) Place the egg whites in a microwave bowl and microwave it for 10 seconds. Remove and place egg whites into a mixing bowl. Beat the egg whites until they begin to be frothy, about 1 minute. Then slowly add in the granulated sugar and continue beating until stiff peaks. Do not overbeat. 5) Carefully fold the dry ingredients, in two batches, into the beaten egg whites with a flexible rubber spatula. When the mixture is just smooth and there are no streaks of egg white, stop folding and scrape the batter into the pastry bag (standing the bag in a tall glass helps if you’re alone). 6) Pipe the batter on the parchment-lined baking sheets in 1-inch (3 cm) circles (about 1 tablespoon each of batter), evenly spaced one-inch (3 cm) apart. 7) Rap the baking sheet a few times firmly on the counter top to flatten the macarons. Leave the macarons aside for about 40 minutes. After that bake them for 15-18 minutes. Let cool completely then remove from baking sheet. 1) Melt the chocolate with the butter and corn syrup in a double boiler over barly simmering water. Remove from the heat and whisk until smooth. 2) Whisk in the half-and-half and sour cream. Refrigerate the ganache for about an hour before using to sandwhich the macarons. My son will be happy if I batch him a batch. My experiment wasn't so I too was deflated. 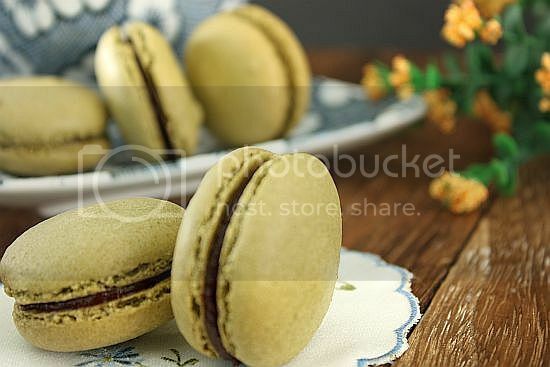 Jo, your macarons looks so nice! Oh wow, your macaroons are beautiful! Since I've got so much egg white left over from the cny cookie baking, making this seems like an adsolutely great idea! Thanks Jo! Your macarons are perfect, Jo!! Love the sour cream ganache. Waw, Jo!! 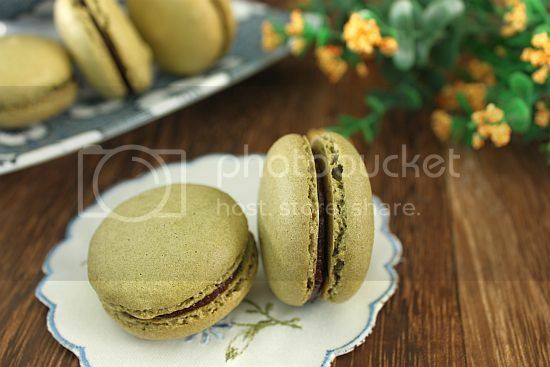 Your perfect mathca green macarons with that tasty & special filling look absolutely FABULOUS!!!! Waw!!! Stunningly styled as well! I just moved my blog to wordpress.com/ Come over @ my blog & check it out! You must update your RSS though! Ooooh....beautiful. I love it. One thing I told myself that I must try this year is macarons. It looks very challenging to me. They taste SO good. omg, macarons! I am so impressed! Perfect macarons, beautiful thick feet!